Product #6454 | SKU 99-072-0305 | 0.0 (no ratings yet) Thanks for your rating! 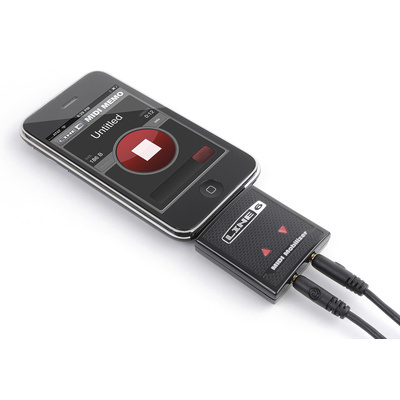 The Line 6 MIDI Mobilizer is a compact and portable MIDI interface for the Apple iPhone and iPod Touch. The MIDI Mobilizer and MIDI Memo application combine to provide a simple solution to quickly record and recall MIDI Data virtually anywhere. Use the MIDI Mobilizer to record a Standard MIDI File (SMF) of a musical idea from a MIDI keyboard, or record MIDI settings (SYSEX) from any MIDI device and instantly recall that information when you need it. The MIDI Mobilizer requires no external power, connects right into the dock connector of your iPhone or iPod Touch, and includes a pair of MIDI cables. Together with an Apple iPhone or iPod touch, and the free MIDI Memo Recorder app, MIDI Mobilizer can play, record, and backup MIDI information any time, any place. Whether you want to capture a quick musical idea or back up the settings of all your MIDI gear, MIDI Mobilizer is the most simple and compact solution for everything MIDI.MIDI Mobilizer is compatible with all models of iPhone and iPod touch. MIDI Memo Recorder is a simple application that records and plays any MIDI data. Free at the Apple App Store, MIDI Memo Recorder features a streamlined interface that makes it easy to store, find and recall all your synth sounds, POD patches, inspirations, and more. Sending music to collaborators has never been simpler. Email your music as a Standard MIDI File (SMF) straight from your iPhone or iPod touch. SMF files can be opened and edited within virtually all Mac or PC digital audio workstations.